Old School Workshop: Smash the Patriarchy! I'm back to the Genestealer Cult mine. This part of the project was something I had on my workbench for quite a while. Some months ago, Paul (the mastermind behind Blind Beggar Miniatures) was so incredibly generous to give away some MDF corridors (by Sally 4th) for my underground dungeon. Thank you, sir!! It took me some time to start with this, and once I begun, it's taken me some more time to achieve any results! Then it was DAS putty time! If you remember my first batch of corridors, I added some graffiti on the walls. This time I wasn't able to do that. The sheer amount of walls to assemble overwhelmed me, so I chose to glue everything first and then paint all in a row instead of painting them separately. It's a decision I had to make, or else I would still be half way with these. Sometimes this kind of compromise is necessary. 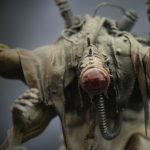 What's the very core element in a Genestealer Cult? Xenos infecting worlds, slowly undermining society and making preparations for the upcoming Tyranid invasion... What makes the difference? That they are a Cult. Religion being a very important concept in Warhammer 40,000, even the Genestealers are into it. The way this Xeno invasion is presented is through religion. Not union strikes, not political dissent, but a cult. The infected members of society are joined under the worship to the Patriarch, channeled through the Magus and so on. The idea of political subversion through religion is something that fits in pretty well in 40K, if you think about it. It all starts with some mockery of the Emperor and the Ecclesiarchy, until it slowly turns into major deviations from the Imperial Creed. So we agree, religion is a centerpiece in all this Genestealer stuff. OK then. But another very important part of the Genestealer Cult is the idea of breeding, the way the Cult expands and how new hybrids are incorporated to the ranks. Not only infecting like vampires, but this expansion model takes whole generations. Literally. So the twisted visions of parenting, family and community are of utter importance in the Genestealer Cult culture. Next step in my digression. Having such a growth model, in which birth has a central role, we can see there's little (if any) attention in official sources to... well, birth itself. We only see the Patriarch and the Magus, but the whole sustainability of the Cult is obscured. It is my firm belief that motherhood needs more visibility. Way more visibility. So, following that train of thought, I think that we are lacking a female perspective in this whole thing. In the Cult part of it. Let me elaborate. This abhorrent society, made of outcasts and mutants, dwelling underground and far from the light develops a worship towards a mockery of the official religion they once knew. But as their beliefs turn apart from the orthodoxy, so does the way of representing that. As birth and the whole natality issue have more specific weight within the families and the Cult, I think it is quite normal that we begin to see different representations of deity. We'll begin to see fertility icons, representations of motherhood incorporated to the cult. I don't know where the fertility icon idea came from, but I think it makes at least a little sense, giving motherhood a more relevant presence in the Cult. In fact I have been thinking that the whole 'subversion through religion' idea opens a lot of doors. I think I may be breaking the Eurocentric vision of religious idols for future stages of this project. Instead of mere mockery of medieval European worship (as I have done so far), I might open the scope to other representations of deity. One of the reasons that GW didn't elaborate on the whole process of birthing four limbed monsters might have had something to do with the whole Fimir thing. Maybe, I dunno, but they may have just decided to play it safe. I think your take on it makes sense anyway Suber, keep on keepin on mate. Your dungeon/mine build is looking great! Oh, and your file hosting site is pretty spammy Suber. Any reason why you don't just use the blogger one? Hmm, thanks for the heads up, I haven't experienced problems, but I'll see to solve that. Thank you! Blimey you are a machine!! Haha, thanks! I hope this absurd stuff makes any sense! Looking good. The little shrine is a great idea. Está muy bien, si quieres grafitis green stuff ha sacado calcas con grafitis, firmas y cartelería . this is inspirational for my walls project for KT: Arena. Thank you! That you, precisely you, call this an inspiration is an enormous compliment! These are great! I love how you incorporate credible, real world ideas into your stuff. It makes it much more believable, even when it relates to four-armed alien broods! There's nothing wrong about four arms! Double hugs! Hugs are an important part of the Genestealer Creed! Oh, that's brilliant! I love your Venus ab Astra and your corridors look great. This whole thing is incredibly well thought out and deliciously executed. Well done! Thank you! I'm exploring the obscure parts of the lore, and it's enormously fun! This is great work, and the idol is a perfect merging of "saints" with the cult and bringing in the fertility idol. If you go back and do any more work on these, you could paste on some posters in lieu of the graffiti. Thank you! Corridors are not that visible, so I had to find a balance and finally came to this. But you are definitely right, more visible rooms call for posters and Genestealer stuff. I must begin to work on that! Very cool idea. Look into some of the Hindu gods and Goddesses Kali. Multi armed, diffrent colors..etc. I am sure you will find something interesting to do with him. Thanks! But this is nothing but some logic applied to the Cult. A tiny piece of lore I made up for them. Any scrap of the Imperium has tons of background, these outcasts needed some love! Fantástico trabajo! Tiene una pinta impresionante. That not only looks great, I like the quirky tone with the fertility goddess and who knows what else you've hidden in there :). Also, that's a lot of bike lights. If anyone dares, that's it. Great looking little shrine,heresy and I guess it should be burned by righteous fire but sweet! Now who would do such a thing and why? And I wonder what might happen if someone did? :) Ah, the joys that shall ensue and the beer that might be drunk while pursuing them! That will be something to be seen!! So cool. Love the sculpted statue it looks fab in place and finished. That small statue in a corner was a great touch. It's all in the little details you add that brings it to life. Thanks! That's what I try, to add tiny details that tell a story. If only my skills were up to the task!